In 'The Grammar of Longing', I examine the nature of memory, displacement, dislocation and migration. 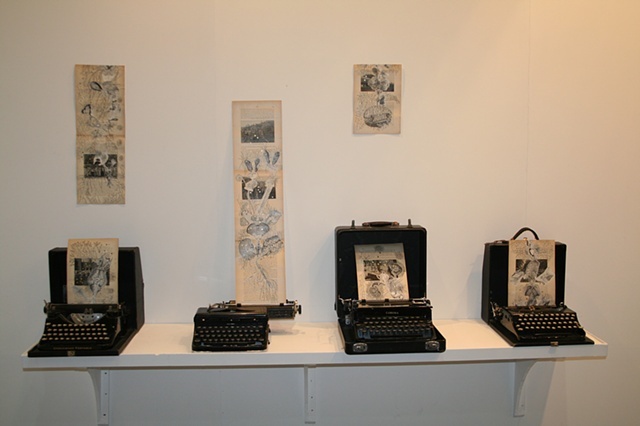 The work was constructed the work using antiquarian typewrites dating back to the 1940' and '50s on which I have placed collaged pages from an antiquarian book dating back to the early 20th century, a travelogue written by an Englishman in India. The collaged images are anatomical illustrations of the human nervous system also taken from an antiquarian medical journal. The materials are meant to allude to and evoke raw emotionality, longing and displacement. The work also obliquely voices concerns about my own migration (albeit by choice) from Mumbai to New York in 2003 and the sense of dislocation that I felt in both places during the years that ensued.